This is the caricature by Selangor born cartoonist, Mohd Zohri Sukimi, 52, better known as Zoy. 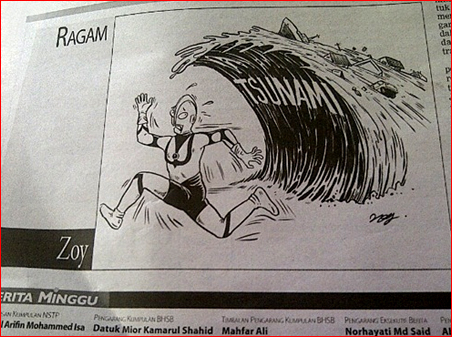 I am a Malaysian and am proud to be one but I'm not proud at all with what this cartoonist did. What was in his mind? Trying to portray that no matter how big and strong you are, you can never match the the hands of God? I think he was out of his mind! He stooped so lowly to kids-having-fun level and made fun out of it. Out of others' misery. I'm not impressed at all! Ultraman is a character in many TV programs and is well known primarily among children and kids (although some adults watch them as well). It is therefore, purely for fun and humor, and nothing near reality. Shoving this kind of "brilliance" to Berita Harian readers' throat at this time of calamity is absolutely uncalled for. Minda saya simpel, seperti juga minda anak-anak yang menjadi penonton utama siri Ultraman di televisyen. Lukisan anda juga simpel dan ia mengundang sifat semulajadi golongan ini: Ketawa! Kenapa? Kerana pada dasarnya tujuan siri TV ini adalah untuk hiburan. Victims of tsunami do not need to become your source of "hiburan". There are a lot of people bashing Malaysian in other oversea forum as well as other International news portal, CNN. To these people, I say that our hearts are with the victims and their families. We certainly do not subscribe to the idea of Berita Harian (whatever they mean by the publication). come on, take your pick!